I have spent an inordinate amount of time in the car ~ by myself ~ lately and it has given me time to think, reflect, contemplate and remember. I have found my thoughts going to friends who are scattered all over and one particular friend has occupied much of my thoughts lately. My friend is quite extraordinary. In fact, she is so extraordinary that I realized you all just have to meet her. She is the kind of friend who lights up a room and makes you realize that life really is full of sweet surprises. 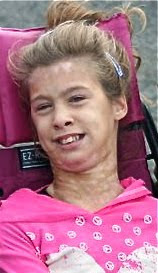 My friend’s name is, Sydney, and she has cerebral palsy. Sydney’s mom and I have been friends since before either one of us was married. Over 20 years of time has passed and we find ourselves with a very firm heart bond that time and distance has not weakened. Laurie is an amazing mom and you all should meet her, too, but that will have to wait for another day for today is all about Syd. Syd is 12 and experienced a lack of oxygen to her brain when she was born (acknowledged doctor error) and she has grown up without the ability to care for many of her own basic needs. There is something quite amazing about Syd, though. Her body may not cooperate as she would like it to, but hear me when I say there is a mind as sharp as any I have met behind those twinkly eyes. Syd has a zest and a zeal for life that many of us show signs of lacking on any given day. She has been blessed with many special friends who have been able to see past her physical limitations to the wonderful, spirited girl that lies beneath. Syd is my FB friend and I am one of many. Sydney lives in Connecticut and many who reside in Connecticut are die-hard Boston Red Sox fans. Syd would fit that category. Actually, I am not so sure that she is as big a Red Sox fan as she is a HUGE Big Papi fan! To say that David Ortiz is Syd’s favourite player would be like saying it snows more in Alaska than it does here in GA...it’s a huge understatement!! Last year Syd decided to write Big Papi a letter and tell him just what a die-hard fan she was of his. Later that year, Syd and her brother, Daniel, got to be the ones to announce, “Play ball!” at the beginning of a Red Sox game. During the festivities, much to Syd’s surprise and squealing excitement, she got to meet David Ortiz. David was able to read the letter Syd had written and it so clearly touched him that anyone nearby could see that he was moved almost to tears. He wasn’t so moved by the level of Syd’s devotion because there are no limits to the number of deeply devoted Red Sox and Big Papi fans. What touched Big Papi so much that night was when he realized that the entire letter Syd had typed out to him had been typed with her nose. 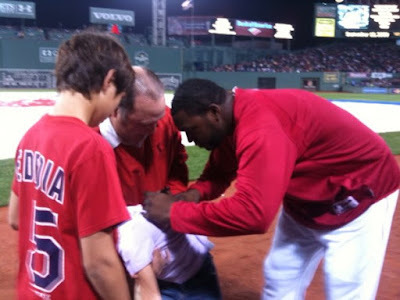 Big Papi signing Sydney's shirt! Do you need me to say that again so you can take it all in? Syd typed an entire letter with her nose!! I am having a hard time typing this blog post without multiple mistakes and I am using numerous fingers. Everything Syd does on the computer...letters, FB posts, etc...is done with her nose. 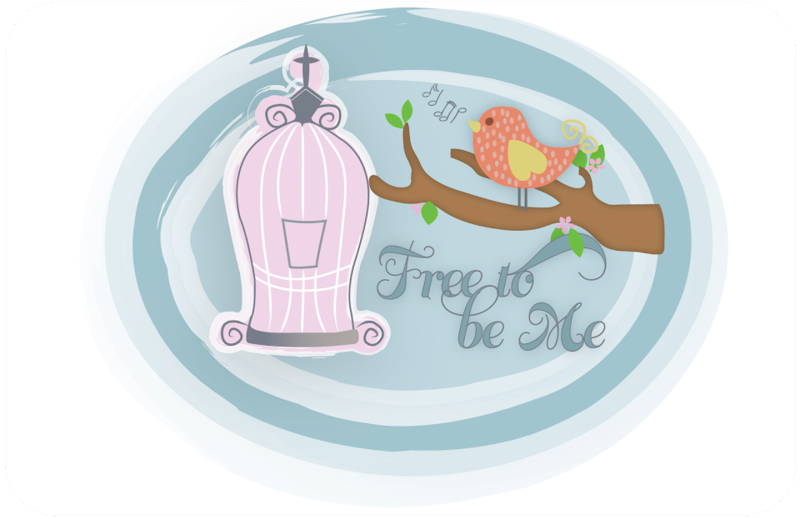 Are you getting a glimpse into why I think my friend, Syd, is quite so amazing? I don’t know about you, but I certainly have days where I can throw a pity party with all the trimmings. I become focused on my limitations and what I perceive as areas that are lacking and thus the spiral begins. Remembering people like Syd helps me realize that attitude is a choice and I always have an opportunity to determine what I will focus on. Thank you, Syd, for being my friend and for reminding me what’s really important in life. Thank you for being a portrait of perseverance and overcoming limitations. Thank you for reminding us all that there is much more to a person than the outward shell they come wrapped in. You’re an amazing girl and I am humbled to be your friend!! What an amazing young lady and testimony! Thank you for sharing this with us, Barb! That is such an awesome post! What an honor to Sydney! I have always loved people with disabilities, worked in the field since high school until I married, and now I have 3 children, two with autism. God totally prepared me for being their mom, and I am completely honored to have been chosen for the task!